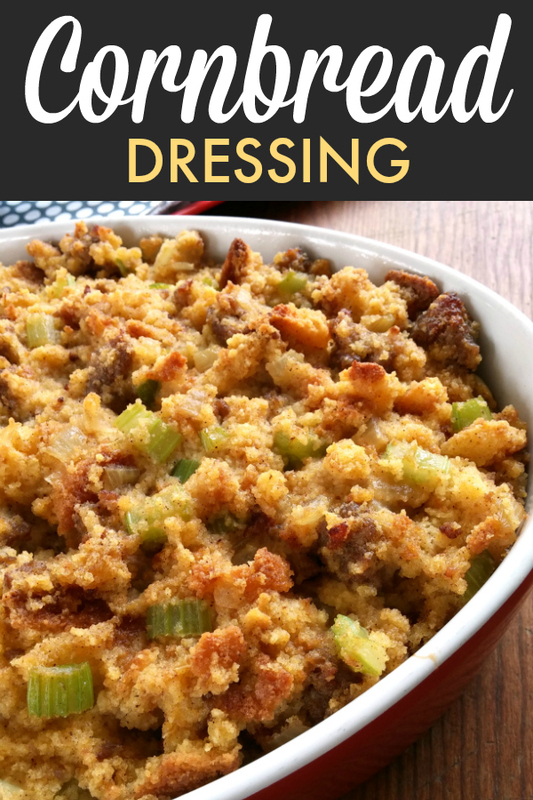 A super easy Southern dressing (or stuffing) recipe made extra special with sausage and cornbread. The development of this recipe was sponsored by College Inn Broth. As always, all opinions are my own. My family’s favorite Thanksgiving dish isn’t the turkey. It isn’t the sweet potato casserole. It isn’t the cranberry sauce. It isn’t the mashed potatoes. So why do we only cook it at Thanksgiving if we love it so much?? 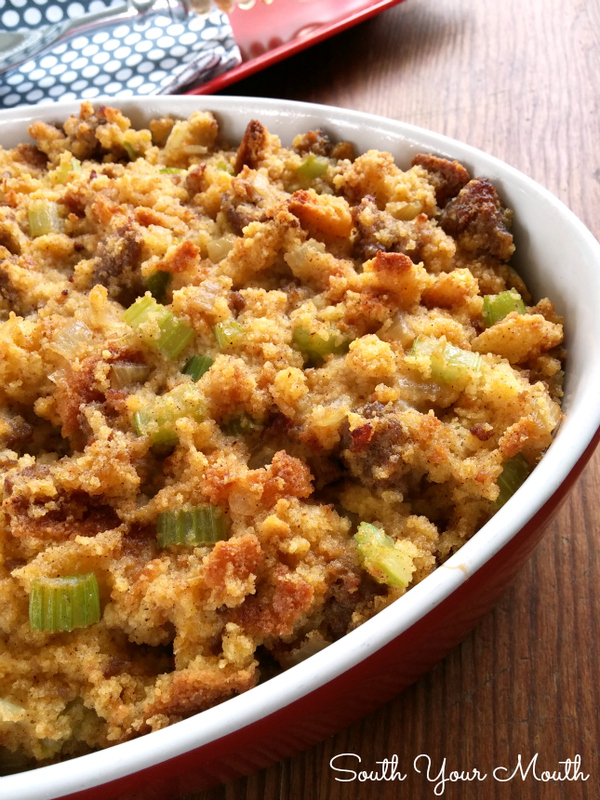 I decided to make my Cornbread Dressing with Sausage this weekend so you can have the recipe in time for T-Day but also to show you how easy it is to make anytime you want it. And if you use rich, high quality broth like College Inn (they even have Turkey Broth – holla!) it will taste just like something you spent all day cooking. P.S… I can always find the College Inn broths at Wal-Mart. When I want to make it extra special, I add sausage to my dressing. If you like, use the sage sausage for a little extra “thanksgivingny” flavor :o) Or feel free to leave the sausage out altogether. 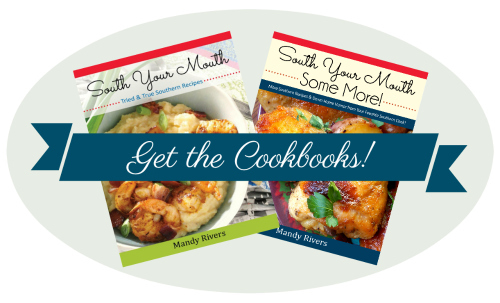 Without, this is a great base recipe for traditional southern style cornbread dressing. Ever wonder why some people call it stuffing and some people call it dressing? What I've always heard (and what makes total sense to me) is if it goes in the bird, it's 'stuffing'. If you serve it as a side dish, it's 'dressing'. 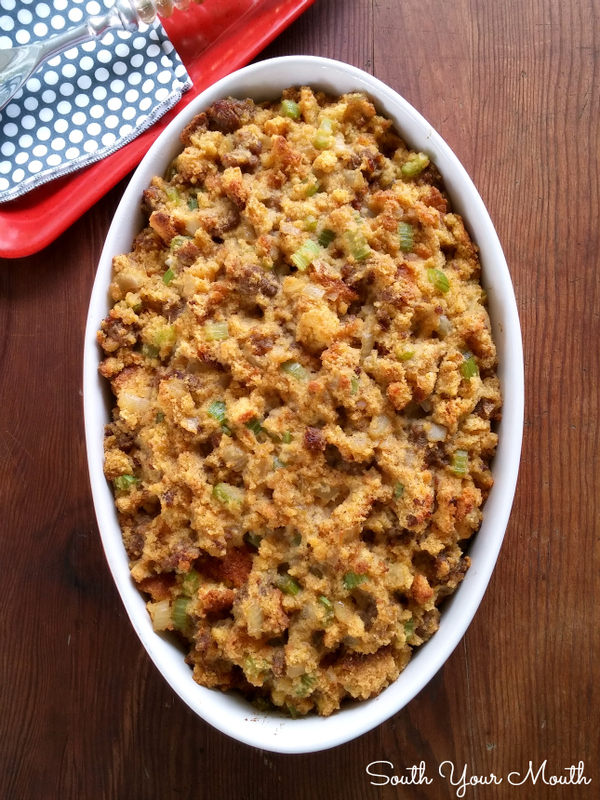 Here's an awesome looking recipe I found for traditional bread stuffing you might want to take a look at if you prefer bread stuffing over cornbread dressing! Crumble corn bread into small pieces then add to a large mixing bowl; set aside. Cook and crumble sausage until cooked through and nicely browned. 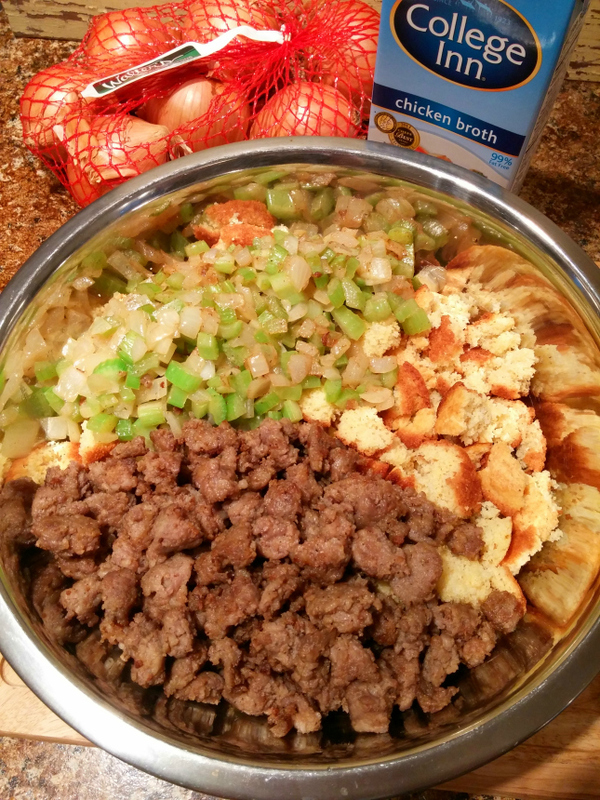 Drain fat then add sausage to the bowl of cornbread (do not stir yet). Sauté onion and celery in butter for 4-5 minutes or until onion is semi-translucent. Add veggies and butter to the bowl of cornbread (do not stir yet). Combine chicken broth, cream of chicken soup, salt and poultry seasoning in a mixing bowl then whisk together until smooth. Pour broth mixture into bowl with cornbread mixture and gently stir and fold until well combined. Spray a 2-quart baking dish with cooking spray (or grease with butter) then spoon cornbread mixture into dish. Bake, uncovered, at 350 degrees for 25-35 minutes or until lightly browned and heated through.